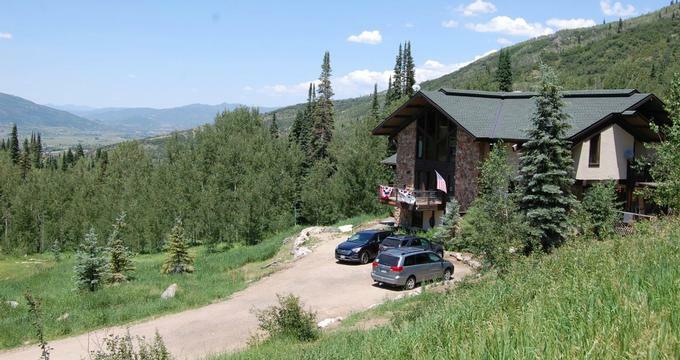 Situated on the border of the Routt National Forest and a short drive Steamboat Springs, the Aspen View Lodge is a 10-bedroom bed and breakfast inn that offers a cozy, home-away-from-home retreat. The classic mountain lodge features massive, rough-hewn timbers, vast expanses of glass, and a significant amount of a moss rock and beautifully appointed guest rooms with private bathrooms, sumptuous country-style furnishings, and modern amenities. A hearty Western breakfast is served every morning in the elegant dining room, a cozy living room has a large wood-burning fireplace, ample seating, and gorgeous mountain views, and an outdoor hot tub offers an ideal place to relax beneath the stars. The Aspen View Lodge is conveniently located within a mile of the Routt National Forest and close to Rabbit Ears Pass, which offers excellent hiking, mountain biking, snowshoeing, snowmobiling, and Nordic skiing. The vibrant resort of Steamboat Springs with its bustling restaurants and buzzing bars is a short drive away. The Aspen View Lodge features ten beautifully appointed and comfortably decorated guest rooms with wooden interiors, carpeted floors, king or queen-size pillow-top beds dressed in high-quality linens, hypoallergenic comforters, and pillows, and en-suite bathrooms with showers, single or double vanities, plush towel and bathrobes, and organic bath products. Spacious sitting areas have comfy armchairs, armoires with flat-screen televisions with cable channels, large windows with breathtaking mountain views, and complimentary wireless Internet. A complimentary buffet-style breakfast is served each morning and includes freshly brewed coffee and tea, fruit juices, fresh seasonal fruit, egg dishes, and daily selections such as baked oatmeal, croissants, blueberry muffins, homemade granola and Greek yogurt, and an assortment of fresh bread. The Aspen View Lodge offers an array of amenities, facilities, and guest services, including a cozy living room with a large wood-burning fireplace, ample seating, and gorgeous mountain views, and an outdoor hot tub offers an ideal place to relax beneath the stars. A complimentary buffet-style breakfast is served each morning against a backdrop of beautiful mountain views, and activities in the area include hiking, mountain biking, kayaking, river-rafting, golf, and fly-fishing in the summer to downhill, cross-country skiing, and snowmobiling in the winter. There are also several mineral hot springs in which to relax. Steamboat Springs and the surrounding areas offer a wealth of activities for the nature-lovers and outdoors enthusiasts, including world-class skiing, snowboarding, cross-country skiing, hiking, mountain biking, horseback riding, hot air ballooning, fishing, kayaking, canoeing, and river rafting. Cultural activities include shopping, art galleries, museums, botanic gardens, concerts and festivals, and rodeos. The Aspen View Lodge offers a beautiful venue for special celebrations and gatherings, such as weddings, elopements, rehearsal dinners, and honeymoons. In addition to comfortable accommodations, homemade cuisine, and attractive amenities, the Inn also offers a professional team of event planners who will take care of all the details and a preferred list of vendors. The Lodge can also accommodate up to 30 guests for business meetings, corporate gatherings, and other functions.